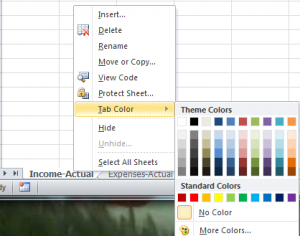 Microsoft Excel uses a default coloring scheme for its spreadsheet tabs. The default color is fine for most applications. However, in an application such as shown in the following screen shot, tabs with very similar names make it harder to quickly locate a specific tab. In a multi-year workbook you could even consider grouping the tabs by year. An application that we recently designed for a client had thirty-three sheets with four groupings. In addition to coloring the tabs we also colored the listing of the sheet names on the index tab to reinforce the groupings. To change the color of one or more tabs, select the tabs, and then right-click with your mouse. 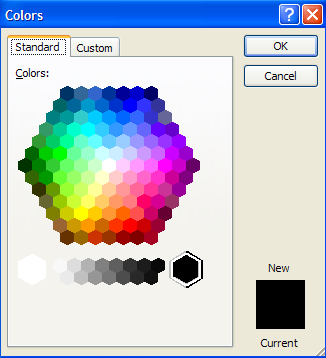 By moving your mouse to Tab Color in the short-cut menu you will be able to choose from a myriad of colors as seen in the next screen shot. 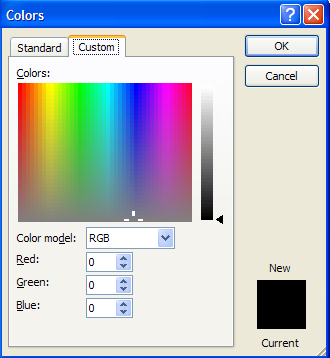 If you choose More Colors… from this menu you are presented with another dialog box where you can choose your color by moving the mouse or entering R(ed) G(reen) B(lue) numerical values. The following screen shot shows how the original workbook might look after applying one color to the ‘Income’ tabs and another color to the ‘Expenses’ tabs. With this color arrangement the user of the workbook can quickly focus on specific sheets, regardless of the actual order of the sheets in the workbook.